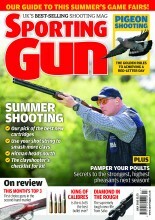 When pigeon shooting how close should the horseshoe be? There are times when the nearest pigeon decoy might only be five yards from the hide, notably on drillings where any available food is likely to be right on the headland, and therefore where incoming birds expect to see their pals feeding. But really, it is all about getting pigeons in close enough to be reasonably certain of killing them every time. There is absolutely no point creating your killing zone 50 yards from the hide, unless your name is George Digweed and you can consistently hit birds at these ranges.